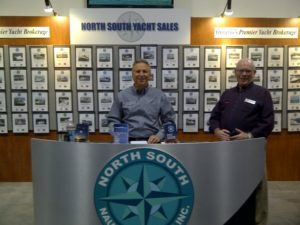 North South Nautical Group is a proud supporter of the Certified Professional Yacht Broker program. We encourage all of our brokers to become CPYB certified and as a team became the first yacht brokerage in Canada to attain the recognition of CPYB ‘Endorsed Brokerage’. But what does it mean for the boat buyer or seller? Isn’t one yacht brokerage as good as another? Like other industries, recreational boating has created professional organizations to monitor its activities. In North America, it’s the CPYB that monitors and regulates the activities of yacht brokers. CPYB certification is rigorous, requiring 3 years work experience prior to applying, an extensive three-hour exam and regular annual re-certification credits. With all that work, boat buyers and sellers can be assured that CPYB brokers take pride in their profession. With a CPYB certification, a yacht broker has made a significant commitment to accountability to their broker peers through enforcement of a strict code of ethics and to a program of continuing education to improve their competency. A professional yacht broker that takes pride in his profession, will also take pride in doing a good job for their client! Learn more about our CPYB brokerage and the services we provide…..
Booth #1737 along the North Wall.